You may already know Joe Arpaio as “America’s Toughest Sheriff,” a title given to him years ago by the media. It’s a title he has earned through decades of service in local and federal law enforcement and now as head of the nation’s third largest Sheriff’s Office which employs over 3400 people. 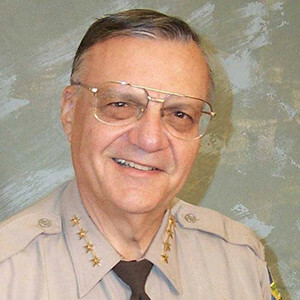 Sheriff Joe Arpaio began his career as a federal narcotics agent, establishing a stellar record in infiltrating drug organizations from Turkey to the Middle East to Mexico, Central, and South America to cities around the U.S. His expertise and success led him to top management positions around the world with the U.S. Drug Enforcement Administration (DEA). He concluded his remarkable federal career as head of the DEA for Arizona. In 1992, Arpaio successfully campaigned to become the Sheriff of Maricopa County. Since then he has been reelected to an unprecedented six 4-year terms. During his tenure as Sheriff of Maricopa County, Arpaio has consistently earned high public approval ratings. With over five decades experience in law enforcement, Arpaio knows what the public wants, “The public is my boss,” he says, “so I serve the public.” He has served them well by establishing several unique programs. In August, 1993, he started the nation’s largest Tent City for convicted inmates. Two thousand convicted men and women serve their sentences in a canvas incarceration compound. It is a remarkable success story that has attracted the attention of government officials, presidential candidates, and media worldwide. Also impressive are the Sheriff’s “get tough” policies. For example, he banned smoking, coffee, movies, pornographic magazines, and unrestricted TV in all jails. He has the cheapest meals in the U.S. too. The average meal costs between 15 and 4 0 cents, and inmates are fed only twice daily, to cut the labor costs of meal delivery. He even stopped serving them salt and pepper to save taxpayers $20,000 a year. As chief law enforcement officer for his county, Arpaio continues to reduce crime with hard- hitting enforcement methods. His deputies and detectives have solved several high-profile murder cases, including numerous child murders. The posse, whose ranks have increased to 3,000 members under Arpaio, is the nation’s largest volunteer posse. Posse men and women help in search and rescue and other traditional police work as well as in special operations like rounding up deadbeat parents, fighting prostitution , patrolling malls during holidays, and investigating animal cruelty complaints. The posse’s contributions are invaluable and essentially free to taxpayers. It’s no wonder Sheriff Arpaio has been profiled in over 4500 U.S. and foreign newspapers, magazines, and TV news programs; his leadership and the excellent work of his staff have catapulted the Maricopa County Sheriff’s Office into the ranks of elite law enforcement agencies.